Information Technology professionals and resellers today face increasing pressure to architect infrastructure solutions offering enhanced reliability, security, storage, and scalability. For this reason, many companies are planning the move to a cloud-based system to reap the flexible benefits which software-defined infrastructure (SDI) can provide. For some companies, the evolution toward ...Infrastructure as a Service (IaaS) or deployment of Hyper-Converged Infrastructure (HCI) represents a daunting task. Organizations requiring extensive customization options may find that generic cloud solutions are simply not up to the task. Open source software solutions may be the perfect choice in these cases. 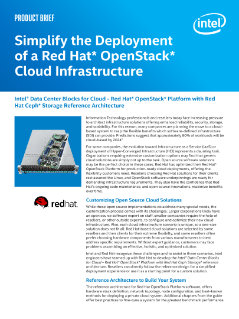 Red Hat has optimized their Red Hat OpenStack* Platform for production-ready cloud deployments, offering the flexibility customers need. Resellers choosing Red Hat solutions for their clients rest assured the Linux, and OpenStack software underpinnings are ready for demanding infrastructure requirements. They also have the confidence that Red Hat's ongoing code maintenance, and open source innovations, maximize benefits over time.